Sunday, September 16, 2 p.m.
A classical and jazz piano recital by a seasoned professional of the world stage is just the ticket for a bright start to a new program year! Esteemed performer Frederick Moyer has been invited by the School Sisters of St. Francis to visit from the East Coast to share his musical gifts. He will be playing the works of Bach, Schumann, Debussy, and Rachmaninoff, along with jazz favorites from The Great American Songbook. 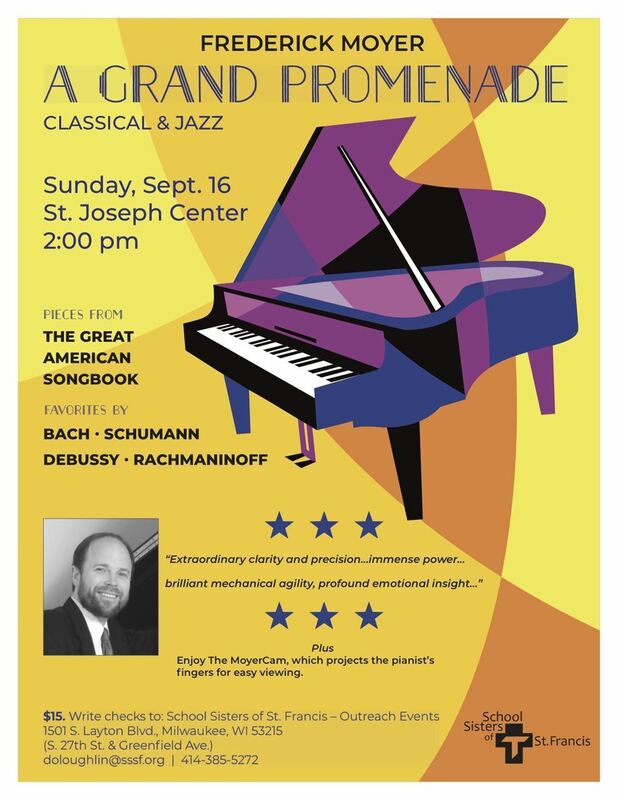 The concert is titled “A Grand Promenade” and will take place on Sunday, September 16, at 2 p.m., at St. Joseph Center. The audience will be enraptured by Mr. Moyer’s technical agility and nuanced interpretations. In addition, his “MoyerCam” provides a closeup view of his fingers working the keyboard. With more than three decades of performing as concert pianist with major orchestras and as a member of jazz ensembles, Mr. Moyer has brought pleasure to thousands of jazz and classical enthusiasts. Famous composers have also written especially for him, including David Ott, Donal Fox, and Pulitzer Prize winners George Walker and Ned Rorem. Mr. Moyer trained at the famous Curtis Institute of Music on full scholarship and at Indiana University, where he studied with Menahem Pressler, among other prominent pianists. What better way to spend a Sunday afternoon than basking in the glow of fine musicianship? The $15 tickets are available by writing checks to: School Sisters of St. Francis Outreach Events, c/o Donna O’Loughlin; 1501 S. Layton Blvd., Milwaukee, WI 53215. Contact: 414-385-5272 or doloughlin@sssf.org. Seating is limited. Free parking at 29th St. and Orchard St.